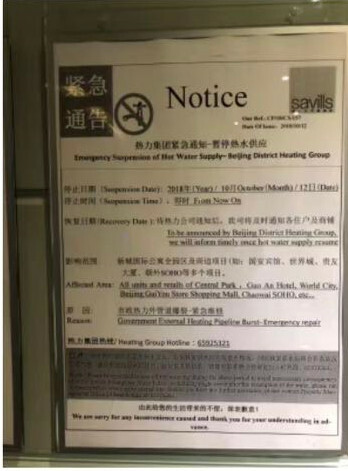 Residents and businesses in an upmarket area of Beijing’s Central Business District (CBD), including the prestigious Central Park compound, have been left without hot water for five days, with the problem unlikely to be fixed before the weekend. The issue has been blamed on a burst water pipe, but residents have complained of poor communication from their landlords and an inadequate response from water suppliers. We contacted Beijing District Heating Group, who said that they expect supplies to be restored this weekend. For David P., this isn’t good enough. He also called for better communication with residents. For those, particularly families with children, who have chosen to book into local hotels until supplies are restored, there may be considerable costs involved, with claims that hotels in the area have ramped up their prices to take advantage. Other Beijingers were unsympathetic, with those living in older compounds stating that this is a frequent problem this time of year. Hot water is often switched off for a week or two in preparation for the change over to winter heating. If this is the case in CBD, it would explain why it’s taking so long to repair a burst pipe. However, it would raise the question of why residents weren’t simply told in advance about the planned works. For many residents, this has come as a reminder that China, for all its wealth, is still a developing country. Some are treating it as a minor inconvenience, for others, it’s a failure to provide a basic utility despite the notoriously high rents in CBD, which have shot up by 40 percent in the last year alone. If you’re affected by this problem, in CBD or elsewhere, we can suggest a solution: water heaters can be purchased for as little as RMB 600 from taobao.com or jd.com. If your Mandarin is still developing too, just copy and paste the characters 热水器 (rè shuǐ qì, “water heater”) into the search box, and look in the listings for the phrase 包安装 (bāo ān zhuāng, “installation included”). If you’re renting, it might also be worth talking to your landlord about whether they will pay for or share the cost of the boiler, which is, after all, an enhancement to their property.